You know, it warms my magpie heart when you guys request Tiara Thursdays devoted to the biggest whoppers out there. And the most popular whopper request by far is this one: the Braganza Tiara. 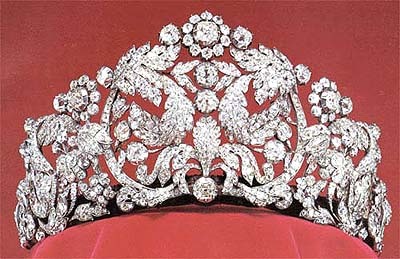 You can spell that Bragança if you like, and you can also call this the Brazilian Tiara, or even the Coronation Tiara. I prefer Braganza, though, because frankly my ears find that to be option that sounds the most frilly. And if there was ever a tiara worthy of a frilly name, it’s this one. Right? Right. Composed of arabesques, flowers, and leaves depicted in diamonds and mounted in gold and silver, this tiara measures 12.5 centimeters (just under 5 inches) tall. It belonged to Empress Amélie of Brazil (hence the "Brazilian"), whose husband Pedro I also used the title Duke of Braganza (hence the "Braganza"). Originally of French craftsmanship from the 18th century, Amélie had the design altered in 1820 to the form the tiara currently holds. Amélie died in 1873, and her sister Queen Josephine of Sweden inherited the tiara. It has remained in Sweden ever since. 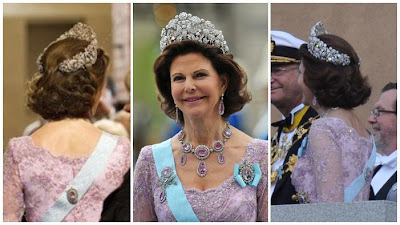 Though the picture below shows Josephine wearing what looks like the Braganza Tiara, it's worth noting that she looks fairly young there and she wouldn't actually inherit it until she was in her 60s. Unlike some of the family jewels that have been used by a wide variety of Swedish royal ladies, this one has always been held for queens. The exception is the future Queen Louise, who wore it as a crown princess; she wore it to the coronation of King George VI and Queen Elizabeth in Britain in 1937 (pictured above). 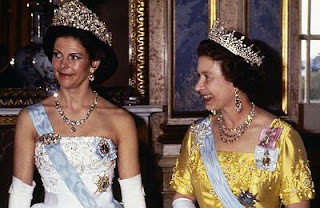 For years, Queen Silvia had a tradition of wearing the Braganza Tiara for incoming state visit dinners and official portraits only. She’s never worn it to a Nobel Prize ceremony, and she never used to take it out of Sweden. This tradition seems to have ended now though, as she has used other tiaras during state visits in recent years and took the Braganza out of the country for the first time during her husband’s reign for a state visit to Denmark in 2007. And of course, it made a memorable appearance at Crown Princess Victoria’s 2010 wedding. At Victoria's wedding, Silvia paired the tiara with the family's pink topaz demi-parure, which was made in 1804 for Maria Pavlovna and came into the family with Queen Victoria (click here for a better picture). With a tiara of this size, you have to wonder how painful it is to wear. As we've discussed, Queen Louise reportedly complained that it hurt her head and gave her terrible headaches. While it has been said to weigh 3 kilograms (6.6 pounds), it’s also been reported to weigh just 1 kilogram (2.2 pounds) and the court jeweler has said it that it’s lighter than most people think. I find it much easier to believe the smaller weight. First, a point of reference: the huge Imperial State Crown of British fame (containing more than 3,000 gems, mind you) weighs only .91 kilograms (just over 2 pounds). Construction is everything and things can be deceptively heavy, sure, but still. Second, go put 6 pounds of something on your head and imagine wearing it for the better part of an afternoon and late into the evening – the same time Silvia would have worn this for Victoria’s wedding. I have a lot of faith in the Queen’s magical tiara-wearing abilities, don’t get me wrong, but I just don’t believe anyone could stand to wear it that long if it really was that heavy. You can see the tiara sparkle throughout Victoria's wedding, but this is a particularly good view: during his dinner speech, the King paid tribute to his wife, as it was also their wedding anniversary. This is definitely one of the largest tiaras in use today. Naturally I love it, especially when you get a chance to see it dance in the light. The only caveat to my affection is the hair underneath: with this much height, it has to be properly balanced out. Some of Silvia's earlier experiments aren't so successful, but Victoria's wedding was perfection. It's held on by magic, for all we know - and that's exactly the effect you want. Giant diamond perfection, or just too much?